I have taken many online art courses through the years, and Juna Biagioni is the one of the finest teachers I have had the pleasure to study with. 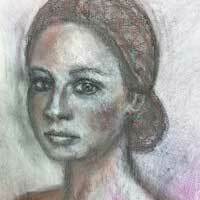 In her class Drawing In the Soul I learned many technical skills in order to compose a portrait. But perhaps most importantly I learned how to let a portrait develop and come forth. I learned how not to force my developing work, to truly let its soul unfold on the paper. Juna is an incredible teacher. I loved every minute of this class and look forward to taking another course with her.